It is very common for patients to complain of sore throat after surgery. The most probable cause behind this postoperative complaint is anesthesia, which is administered to anyone going through a surgical procedure. The incidence of sore throat varies considerably depending on the method used to administer anesthesia. The occurrence of sore throat after surgery varies between 14.4% and 50% for those who were given anesthesia through tracheal intubation. These figures dropped significantly for those who were anesthetized using laryngeal mask insertion; the incidence of sore throat, as reported by patients, ranges from 5.8% to 34% in this case. This significant variation in figures is primarily due to different skills and techniques used by anesthetists. Why Would I Have Sore Throat After Surgery? It is imperative for every anesthetist to vigilantly monitor and regulate a patient's breathing pattern while the patient is undergoing surgery. If the patient is provided external support while breathing, he is much more likely to suffer from a sore, scratchy throat once the operation is completed. However, not all patients need external assistance; some are able to breathe on their own. For those who are unable to do so and for those undergoing surgeries related to the abdomen or chest, intervention is necessary. The two most widely used methods of monitoring and controlling a patient's breathing are insertion of a breathing tube or a laryngeal mask airway (LMA). Insertion of a breathing tube or intubation is the most common way of administering anesthesia. This method is used if the surgery pertains to the abdomen, chest or brain. Intubation is a fairly straightforward process; the doctor places an endotracheal tube into the mouth of the patient and slides it down the throat while he is unconscious. Although a simple procedure, intubation generally results in a sore throat after surgery since the back of the throat and windpipe are extremely sensitive areas. Although soreness of throat usually alleviates on its own, drinking ice cold water and sucking on lozenges can resolve this problem within a day or two. Another way to administer anesthesia is through a laryngeal mask airway. This method is generally used if the surgery is to be performed outside the body cavities. The laryngeal mask is an airway tube connected to a soft, rubber mask, which is inserted into the patient's mouth and slid down the windpipe. It is adjusted to fit at the back of the throat and creates an airway allowing anesthetists to channel oxygen or anesthesia gas to the patient's lungs during the surgery. The incidence of sore throat after using a laryngeal mask may be lower but is still fairly frequent. The patient is quite likely to suffer from dehydration as he is not allowed food and drink before surgery and even after surgery. It is common for the patient to experience pain who underwent insertion of a breathing tube. This pain generally subsides within three to seven days. However, it becomes necessary to seek medical attention if the pain lasts longer than that or if the throat starts to swell. 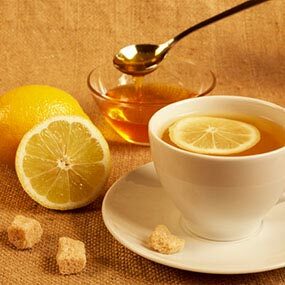 The best way to soothe the pain is to add honey to warm water or tea; preferably, a dollop should be added to the mug when drinking these beverages. Drinking warm fluids like tea and limiting the amount of speaking will also help relieve the pain. Over the counter medicines such as lozenges and chloraseptic sprays are also effective when it comes to reducing pain. Lozenges keep the throat moist and soothed. In fact, menthol lozenges can completely null out the pain. After the surgery is complete, patients often wake up feeling quite groggy and disoriented. Along with soreness and general discomfort of the throat, patients often have other post-operative complaints as well. It must be noted, however, that most of these side effects of general anesthesia occur immediately after the operation and gradually subside with time. Nausea and vomiting are the most common side effects; patients tend to usually regurgitate as soon as the effect of anesthesia wears off. However, vomiting and feelings of nausea last only up to a day. Some patients may also feel cold and suffer from shivering but this too subsides generally within a few minutes or an hour at the most. Almost everyone complains of dizziness and disorientation and this is more frequently reported by patients who are older. Doctors usually encourage increasing the intake of fluids as a treatment for dizziness. Some elderly patients may also suffer from temporary memory loss. Although generally not the case, this amnesia may be long lasting. There are other possible side effects of general anesthesia but these are not so common among patients. One such side effect is possible bruising and soreness of skin especially at the point where the patient had a drip fitted or was given an injection. The bruises and tenderness of skin usually dissipate on their own and do not require any medical treatment as such. Another rare side effect pertaining to general anesthesia is damage to the mouth or teeth. Due to insertion of a breathing tube, sometimes the patient may suffer from cuts and mild bruises on the lips and tongue. In some cases, teeth may also be damaged. To prevent the latter from happening, it is important for the patient undergoing surgery to notify his doctor about any recent dental work before the surgical procedure is performed. This can help limit the damage done to teeth. All of the side effects mentioned so far are quite prevalent among patients. Not only are these complaints perfectly normal but they also usually disappear on their own without any medical treatment. However, in rare cases, serious complications may arise. Breathing difficulties, severe allergic reactions and waking up during the surgery are all possibilities that cannot be ruled out. In extremely rare cases, death may also occur. It must be noted, however, that all the side effects that have been mentioned so far will vary from person to person and depends largely on the type of surgery to be performed and the current state of health of the patient.